We got some okay picture for our card, but could not get a single picture of the boys together (which is what I had hoped to achieve). 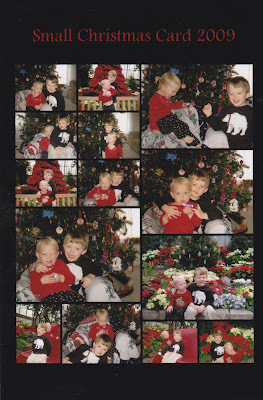 I was all set to illegally scan a professional family photo from the summer, but Costco's website said they required a signed authorization form from the person placing the order and the photographer. Freaked me out. So glad the 12 days are back! M.
I love that you threw the cactus line back at O! Too funny! I don't know what software you use, but Photoshop Elements has a tool that allows you to merge photos. So if one person has their eyes closed or not smiling, you can merge the photo with another where they are. I haven't used it yet, but it's supposed to be pretty handy.